Action Solitaire Game Review - Download and Play Free Version! Play 65 types of solitaire as fast as you can to beat the clock and score tons of points in Action Solitaire. Download the free version, read user reviews, view screen shots, read about the game and more. 65 games of solitaire means plenty of variety. Some interesting games that differ from 'typical' solitaire. Help button instructs you how to play each game, with definitions for all of the potentially confusing technical words. No music and game sounds are virtually nonexistent, making the game feel very disconnected. Graphics are old, flat and boring. No story mode or 'tour' to tie the games together. Add Excitement to All Your Favorite Solitaire Games! This game turns solitaire into an adrenaline-rushing battle to beat the clock! The faster you can beat each game of solitaire, the better score you receive and the better rank you can achieve! 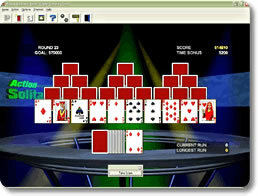 Choose from 65 different solitaire games, including Klondike, TriPeaks, FreeCell and much more. Your possible score counts down as you play, so win as fast as you can! If you earn enough points, you'll advance to the next round and have the chance to earn outrageous amounts of points. Enjoy easy-to-understand rules for each game and submit your scores online to compete with the best players. Competitive gamers will love the fast pace of this game and the awesome variety of solitaire games to play! The fast-paced strategizing will get your brain working and refresh you during any break. Learn to make split-second decisions and learn tons of fun new card games! The clock is ticking! 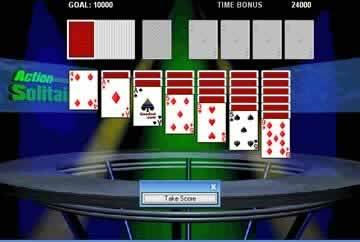 Play Action Solitaire now to score huge points! While it lacks a lot in the action department, Action Solitaire is a nice collection of solitaire games for the avid solitaire fan. Sporting 65 versions of the traditional card game in one place gives this solitaire collection plenty of variety without being overwhelming. Most of the games are very similar in gameplay, however, and there is little to no visual appeal. If you are a solitaire addict and don't care how the game looks, give Action Solitaire a try. There is a help button which explains how to play each game, with definitions for technical terms like “tableau,” (which is basically the piles of cards you are trying to clear), “foundations” and “stack.” This helps a lot for those who are not familiar with the intimate details of solitaire, but the explanations of game rules can be very vague and confusing. This can be rather frustrating for casual players, who will have to constantly check the game rules to figure out why they aren't allowed to move a stack of cards, or why certain cards seem to just disappear. The graphics and sound are sadly lacking in this game too. While a serious solitaire player doesn't need fancy animations or bright, entertaining colors, the average player needs a little visual stimulation. The graphics are flat and 2D, and are focused solely on the cards. There are backgrounds, but they don't move, sparkle, or even look exciting. This makes playing the game rather boring, because you have nothing to look at or anything at all to capture your attention or imagination. The sounds follow the same precedent. There is no background music or sound effects. The only sounds the game makes are cards being flipped over, and occasionally a sort of error noise when the player tries to do something they aren't allowed to do. This kind of silence combined with the boring backgrounds and graphics make Action Solitaire a game that is focuses entirely on the actual gameplay, which is repetitive and all very similar. If you are a huge solitaire fan, give Action Solitaire a try for its fairly large collection of solitaire games. If not, you will probably want to avoid it for its lack of visual and audio appeal, the repetitive nature of gameplay, and the lack of story mode or anything else to tie the games together cohesively. 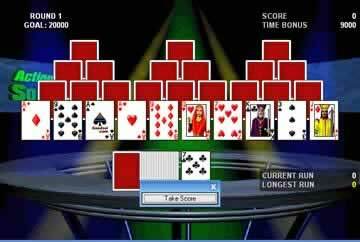 Action Solitaire is simply a compilation of 65 solitaire games. If that's all you're looking for, then it will probably be worth the download. However, if you expect a little something more from your games, skip Action Solitaire all together and try something else.